Electric openers are actually a system with a motor that allows to the door to move automatically with the force of electric power. They are some of the most important parts of the garage system and they can also be disconnected should the owner wish to open the door manually. All Garage Door Openers are actually required to have an emergency release cord but also safety sensors so that kids, pets, and objects are protected from the closing door. They are operated with a clicker or wireless garage door keypad and there is also a panel on the wall. Depending on the manufacturer and the model of the opener, the wall panel might only have a switch on and off button for the opening/closing of the door, but also an extra button for the manual turning on and off of the lights and a button or switch for the locking of the door. 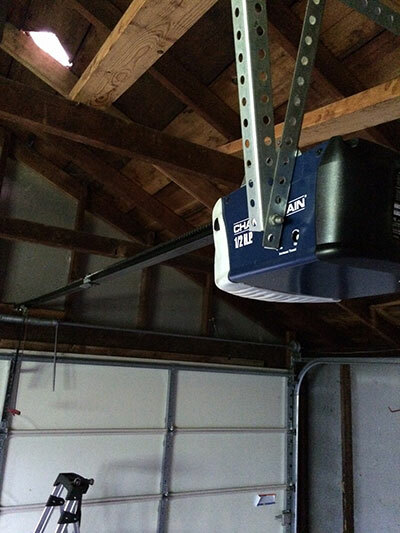 There are some variations among Garage Door Openers depending on the brand, model, and type of the opener. Garage Door Repair Laguna Hills is familiar with all operators and all manufacturers. Therefore, it can be useful to you regardless of the type of your opener. Our adept team is studiously knowledgeable regarding door operators for garage systems, since they strive to be aware of all their particularities. Such intense knowledge allows us to do our garage door repair job better and be great advisors to our customers. You can be sure that we excel in Genie opener repair and handle any problem with any model by Chamberlain, Craftsman, Sears, and Marantec. We specialize in Liftmaster door opener maintenance and during Garage Door Won't Open services place great attention to every component and especially to the safety sensors. Whether installing or maintaining electric door openers, we guarantee the sensors are aligned and all parts in good working condition. Our repairmen respond fast when there is an urgent opener problem and offer emergency repair. Don't hesitate to report your opener problems to Garage Door Repair Laguna Hills via email or phone.